Now that I've had some time to truly process the race, I have a few additional thoughts I'd like to share. First of all, this week has been a shock to my system. I took Sunday-Wednesday off completely and I don't think my body knew what to do with all the energy it would have spent on running. Without fail, I woke up between 2:00-3:00am each of these mornings, and was awake for at least an hour. In fact, on Monday morning, I woke up at 2:30 and never went back to sleep. Physically, I haven't been feeling the affects of this lack of sleep, but I've been moody and cranky. The combination of little sleep and zero running is not something I'm used to, and I've found that my tolerance for "annoying" things this week was close to zero. I ran for 20 minutes on Thursday morning, which seemed to nudge my body back to normalcy in terms of its regular rhythm. Of course, all of this will go to hell now that we've lost an hour of sleep to daylight savings time. 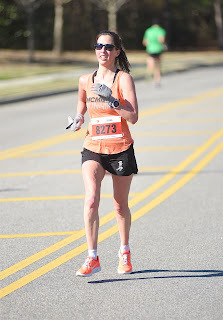 In spite of all of this, plus the busiest week at work I've had since I started this job last September, I was able to reflect more on my performance at the Myrtle Beach Marathon last Saturday. 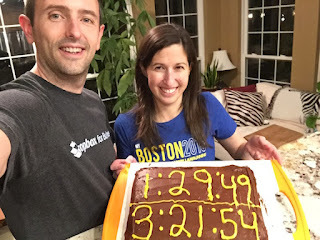 Greg and I made ourselves a PR cake to celebrate our achievements when we returned home, and I began to think more about how a 3:21:54 "tasted." I've been wanting to experience this for so long, and I finally had a taste of running a super fast marathon. What did it mean to me? Let me back up a bit. When Greg and I sat down for dinner on the Thursday evening before the race, I noticed how at ease I felt. This was such a huge contrast to how I used to feel in the days leading up to a marathon. I used to feel like there was a monkey on my back, or something hanging over my head. I wasn't at peace mentally. It's moments like these, when I truly feel like a more relaxed, peaceful person, that inspired me to write my book. Overcoming race anxiety was a life change for me, and I didn't realize just how negatively it was affecting my sense of well-being until I was able to move past it. I mentioned in my race report that I slept well the night before the race, and that was mainly due to the fact that I had a peaceful, relaxed state of mind. Sure, I was excited, but excitement is a feeling, whereas my previous anxiety was a state of being. It was all-encompassing. One of the most important mental skills I've learned in racing is to stay emotion-neutral. It's helpful to stay focused on the task at hand and not be impacted by things outside of my control. Anything can happen during a race, especially if it's as long as marathon, so I've found it helpful to be "immune" to my surroundings and completely focused on my race execution. This includes my pacing strategy, focusing on the mile I am in, my nutrition/hydration schedule, and being aware of the course. Some people take the approach of feeding on external things like crowd support, scenery, etc. Greg is like this. He likes to be distracted. I, on the other hand, find it mentally taxing to think about anything other than running. When I reached the halfway point, a thought briefly crossed my mind: I'm doing it. 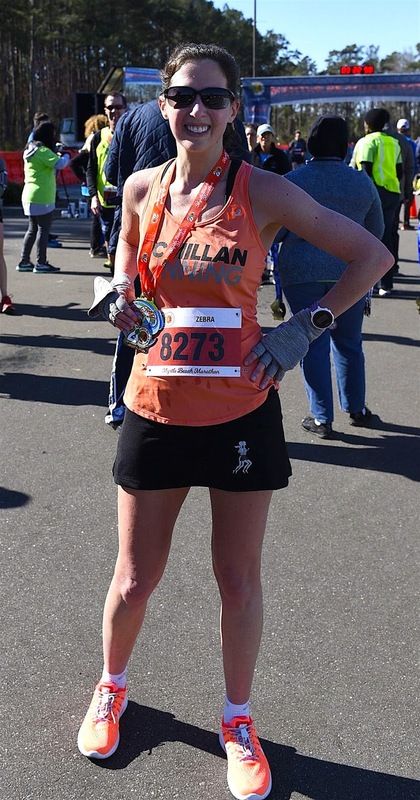 For several years, my anxiety would cause me to slow down as early as mile 8, and by the halfway point I would drop out or simply give up because I knew I wouldn't reach my goal. Once I started working on my issues, I would approach miles 8-13 hoping that this stretch wouldn't be the end of my race. The thought came and went very quickly. As I said above, I was emotion-neutral throughout the entire race. But I did take a mental note that I was at the halfway point, running a 7:40 pace, still feeling like I had plenty of energy in the tank. I didn't write much about miles 22-26 in my race report. I slowed down by about 10-15 seconds per mile, which I think is to be expected during a marathon. In retrospect, I wonder if I could have pushed a little harder and endured a little more pain. But I actually had a thought during mile 24: "If, after the race, I question if I could have pushed harder, the answer is no. I am pushing as hard as I can right now and everything hurts so much." It's always easy to go back and wonder what you could have done at a certain point in the race, but remembering that thought re-assures me that I did leave it all out there and perform to my full potential. At that point, I knew I was going to set a huge PR and BQ, but I refused to let myself think about that. Even though those are very motivating thoughts, I felt like I needed every ounce of mental energy to convince myself to keep pushing hard. I couldn't afford to think about anything else other than maintaining the effort because if I stopped thinking about it, I would surely succumb to my body's desire to slow down. As I approached the finish line, I didn't feel any more or less excited than I would at a 5K. Like any other race, I was focused on my final kick and getting every last bit of speed out of my legs. Afterwards, I was excited about my performance and my time, but not as excited as I have been about previous races. I think I "neutralized" myself so much that the positive emotions just weren't as strong as I would have expected them to be. Maybe it just took awhile to process. Maybe it still feels surreal. Just yesterday, I saw someone on Strava run a 3:25 marathon and I thought to myself "wow- that's so fast." And then I realized, "wait a minute-- I just ran a 3:21." So maybe the process of realizing I'm at a whole new level as a marathoner is just taking its time to settle in. Maybe part of it is that I don't define myself by my running like I used to. I can run a fast time and have it be just that- a fast time. It's not life-changing. It's not like I'm a new person. I was far more emotional when I crossed the finish line of the Shamrock Half Marathon last year, and I think it's because I realized how much I had to overcome to run the race that I did. In 2010, I DNF'ed the full marathon. In 2011, I couldn't run the race because I was injured. In 2012, I DNF'ed the marathon for the second time. In 2014, I was the only person on my running team who didn't set a half marathon PR, because I let the wind slow me down substantially. Everyone was getting faster. Everyone else conquered the wind. I was slower and I couldn't handle the wind. So I was literally holding back tears when I crossed the half marathon finish line in 1:33:36, in even windier conditions, setting a PR by over two minutes. That was the ultimate redemption. seemed like a normal week. I didn't do a ton of "basking" and at times I had to remind myself to relish in my accomplishment. It could be because work was extremely demanding and I had to prioritize my mental space on that. My next marathon will the Indianapolis Monumental Marathon in November. I was registered for it last fall, but due to having mono all summer, I was unable to run it. My coach thinks, and I agree, that I can still run faster in the marathon. I'm not sure what I will be targeting there. Definitely sub 3:20, but how much "sub" is to be determined. Greg informed me this morning that he'd like for Indianapolis to be his first BQ attempt! I'm so excited because I really enjoy coaching him and watching him improve. I definitely think he's capable of qualifying and I hope they don't change the standards for 2019. The Cherry Blossom 10-miler is my most immediate goal. The last time I ran this race was in 2014, with a PR of 1:15:26, which is only 10 seconds per mile faster than marathon pace. 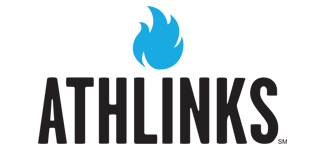 I'm really excited to see what I can do coming off of this training cycle, particularly since the 10-mile distance is probably the most "enjoyable" in my mind. You get to run it hard, but not for as long as a half marathon, and not quite as painful as a 10K. A happy medium. As for my recovery, I ran on Thursday, Saturday, and Sunday of this week, each for 20 minutes. My total weekly mileage is 7! My legs feel mainly recovered, with just some minor lingering soreness in my right lower hamstring. Next week I will be running a bit more, but everything will be easy. I won't get back into speed work until the week after next. Do I miss marathon training? No. I'm happy to have a break from it. I think I'll be ready to be back in full force come August, though. In the meantime, shorter races will be the focus. Totally agree on 10M distance! Congratulations again and that cake looks delicious! I bet you'll do really well at the Cherry Blossom race, but for now just rest and recover. Besides, you had a lot of missed rest days to make up for with that streak you had going ;). LOL, very true. I am likely going to have a few un-planned rest days with all the snow/ice here. I've had similar experiences with anxiety/pressure to do well. I pushed myself so hard trying to get a BQ that I ended up in the med tent at the finish line. The next marathon my only goal was to avoid the med tent. Then what do you know? A BQ and five minute PR. I just ran a 10M race today, it's among my least favorite. I really love something between the half and marathon so 10M seems so short. I'm guessing you don't ever do 5Ks, then? Congrats on your BQ. It's amazing what happens when we just chill out about things. Wow...you have a propensity...even in spectacular success to still question whether you could have done more! I wish I was as good and demanding as you! The "slow-down" in last 10k or less..as you eventually note. no big deal, can be expected and only have to run through the pain and faster if you world elite. But even world elites, including the infamous Kenyan and Ethiopians, don't always run for their fastest time in that last stage...just matters where they will place. Considering you were lead female...and holding that lead...you ran what you needed to get the PR and 1st overall female! That's what any elite Kenyan or Ethiopian marathoner would do...win the race...finish time irrelevant! Give that some thought Zebra! 2nd thought...enjoy the cake...your triumph over long years of adversity...time to have and eat your cake...so to speak. Grete Waitz signed my Bib one year at Boston Expo..."Dreams Come True!" Add that mantra to your collection...if you keep one. 3rd thought...we share at least one trait...obsessive with data and critical analysis! Note your FT of 3:21:54...6-sec less than 3:22 flat. In 2011, I ran my fastest marathon at Boston...3:24:56. 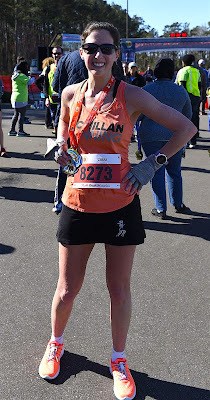 My goal was to beat 3:25 and all I could do running hard down Boylston and watching my Garmin which was at 3:24, but not showing second...just saying..."don't change! I only beat that time goal by 4-sec. I wonder if you were thinking anything like that with your watch 3:21 coming down home stretch? Lastly...about your plans for Indy Monumental. I ran that in 2015 and they had corrals and I was seeded in C. Problem was I couldn't get to Corral C cause the sidewalks and everywhere were blocked with runners. Yes the were lined up at entrance to corral gates...body-to-body on the sidewalks...no way to get through. I spent nearly 10-mi of that race expending energy to run through blockades of far slower runners...finally catching up to what should have been my pace group and slightly ahead of them...until 14th mile nausea and other issues developing and gave it up by 20-mi just to run/slog-walk it in to finish. Despite having "seeded" corrals...there were no race personnel to enforce it. And based on my experience....there were a lot of back-packers up in those high-end corrals. I saw something online for the 2017 Monumental says "Corrals"...but if you don't want to experience the hassle I did...better check if those corrals are entry only by designated seeding "enforced" by race personnel. Or...you better get there real early to corrals...1-hr before start and stake your turf. Congrats on that Myrtle Beach Boston-caliber performance. Maybe I cross your path in Boston this year? Otherwise...enjoy your cake and I am sure Greg will be on your path and get his BQT and one year...you both are running the Boston Marathon! Cheers to ya and Greg too on that 1/2 time! Thank you for your ongoing support. I ran the Indy Monumental half last year as a training run and the corrals were a bit of an issue. I didn't care, because I wasn't trying to run fast. I won't be in Boston this year, but next year for sure! It sounded like the perfect race. You were confident, well trained and in the zone. Good luck for the 10 miler! I've heard about that race and would love to do it one day. Yes, definitely add Cherry Blossom to your list! Thank you! That cake was so good. Enjoy that recovery! I know exactly how you feel when you read a race time and think, "So fast" but - you're there. YOU'RE fast! I got significantly faster in the space of half a year when I started doing track workouts with a group (I took 30 minutes off my marathon between October and March), and since those slower times were so recent for me, I couldn't wrap my head around being faster! I'd line up in the wrong corral, I'd run my track workouts at the wrong pace, etc. So embrace the speed. Own it and go PR some more! Thank you. Yeah, I'm still wrapping my head around the idea that I am a 3:21 marathoner. Whoa!